Elaborately decorated crazy quilt composed of irregularly shaped and multi-colored silk brocades, taffetas, and velvets. Quilt is made up of 20 large square blocks, each with embroidered initials or a name (probably indicating its maker). Outline embroidery on pieces, plus many detailed decorations worked in embroidery or paint. Some unusual details include pieced fans, a large horseshoe, and sequins and beads. The year 1887 appears in embroidery several times, as well as a few full names?Mrs. May Hunter, Annie Haag, and E.L. Martin. Backing of dark red wool, turned over onto front edge to form binding. Trimmed at each corner with cluster of silk ribbon bows. 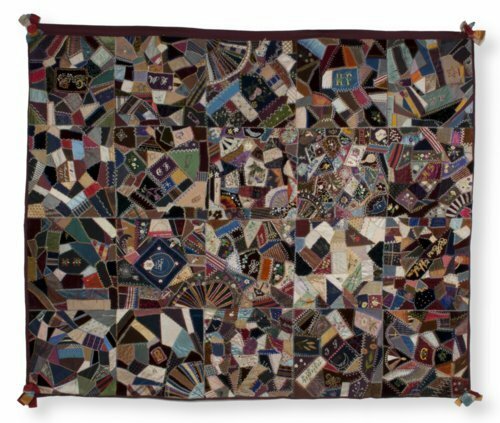 This was a friendship quilt made for Bertha Frische Younggreen by her sewing circle in Topeka, Kansas.